• What does this mean? An advisor has the ability and the time to evaluate your portfolio investments, meet with you to discuss objectives, and help get you through tough markets. All of these factored together potentially add value to your net returns (returns after taxes and fees) over time. • With portfolio construction, an advisor can work with you to create a diversified portfolio, while ensuring you don’t pay too much for investments or in taxes on investment returns. • Portfolio management entails making regular changes to your investments to help reduce risk, and to potentially take advantage of short and medium term opportunities that could be overlooked by the weekend and part-time investors. Research is not an exact science. 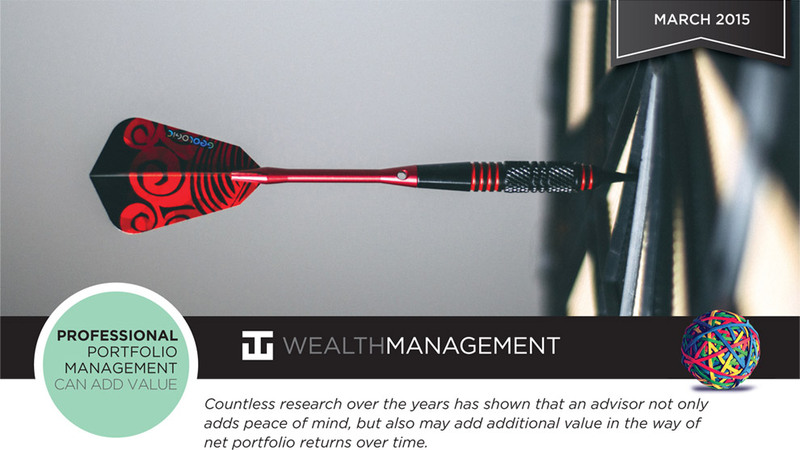 Adding to client returns means advisors can potentially add measurable percentage points to your portfolio returns over time. This is in comparison with those who are not practicing the above-mentioned principles. For some investors, advisors may offer much more in added value; for others, much less. The potential of additional returns come after taxes and fees. Additional returns are not added over a specific time frame but can vary each year and according to your circumstances. It can be added quickly and dramatically, especially during market declines or euphoria events, when you may be tempted to abandon your well-thought-out investment plan. Or it may be added slowly by making many small, timely and incremental changes to your portfolio. It will not appear on the quarterly statement but the impact is real nonetheless. Further, although every advisor has the ability to add this value, the extent of the value will vary based on your unique situation and the way the assets are actually managed, versus how they could have been managed. Advisor’s alpha principles call for advisors to meet your individual needs. The biggest value your advisor can provide is behavioral coaching. This is most important during market turbulence, when you may feel the need to abandon your asset allocation and move to cash, for example. Consider three hypothetical investors during the period between October 9, 2007, and March 31, 2014, each starting the period with a balanced $100,000 portfolio. The investor who moved this balance to cash at the 2009 stock market bottom lost $29,000. The investor who moved to an all-bond position at the stock market bottom lost $10,000. But the investor who stayed committed to the predetermined asset allocation, in the end, gained $41,000. A good financial advisor is there to counsel you, listen to your concerns, and, essentially, guide you on the right path. Your advisor works with you to add value throughout the course of your relationship. Notes: The 50% stock/50% bond portfolio is represented by the Standard & Poor’s 500 Index and the Barclays U.S. Aggregate Bond Index (rebalanced monthly). The 100% bond portfolio is represented by the Barclays U.S. Aggregate Bond Index. The 100% cash portfolio is represented by 3-month Treasury bills. This is a hypothetical illustration. Maybe surprising and maybe not, there is a gap between what investment markets return vs. what individual investors end up coming home with and that gap can easily be explained by the investors’ highly predictable behavior. 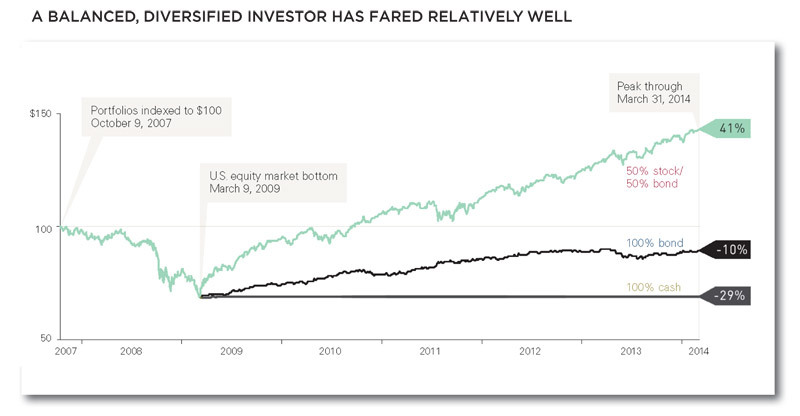 Investors have a remarkably consistent tendency to buy funds at peaks, sell out at lows, trade too often, sell winners, double down on losers and pay exorbitant trading and management costs, most unaware of the repeated damage they do to themselves. Many call it an anomaly – but it’s so permanent and unfixable, through every era, that to refer to it as an exception would be wishful thinking. At WT Wealth Management we have spent a lot of time educating investors and many of you already know that most mutual funds and active managers underperform their respective benchmarks. That’s one of the many reason we use ETFs – but did you know that investors acting on their own somehow manage to even underperform the underperformers!? According to an investing study from a well-known fund manager, the average large cap mutual fund returned 9.9% annualized from 1991 to 2010, but the average fund owner earned only 3.8% on average per year. The discrepancy is not pretty. It hurts even more if we put this performance into dollars. 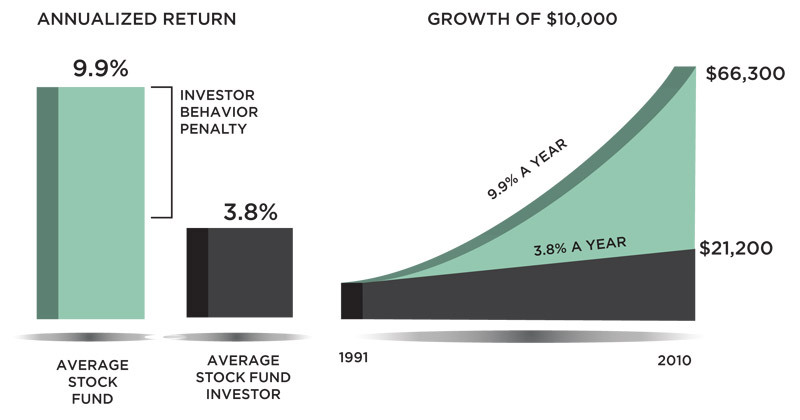 By trading in and out of funds, always at the worst time, the average mutual fund owner had a $10,000 investment grow to just $21,200 over nearly two decades. At the same time the average large cap mutual fund turned that $10,000 into $66,300. Now imagine the continuing effects of compound returns on both of those amounts and the growing difference between them over a lifetime. Remember this the next time you’re tempted to make a trade when the markets are selling off. Research in many cases has found that the less trading a fund or manager does, the better the results tend to be. What’s true for individuals is true for professional managers, too. As financial advisors do we think we can add a measurable amount in net returns for our clients using a disciplined framework that focuses on portfolio construction, cost, behavioral coaching and asset allocation modeling while being patient and disciplined? We certainly hope so. However we absolutely feel we can outperform those advisors that are not employing such practices. Unfortunately, there are millions of them that act on hunches, emotions, full moons, high tides and thinking they are smarter than what empirical data has proven. As advisors, we believe we have the opportunity to meaningfully improve investor returns and we are pleased to be able to provide clients a mechanism to a systematic, methodical, disciplined approach to portfolio management with our TimeBand approach to portfolio construction. As the industry continues to evolve from a commission-based to a fee-based model, advisors who successfully explain that less activity can lead to more results will help clients understand it’s time in the market and not market timing that leads to consistent long-term returns. •	Being an effective behavioral coach. Helping clients maintain a long-term perspective and a disciplined approach is arguably one of the most important elements of financial advice. •	Applying an asset allocation strategy. The allocation of assets between taxable and tax-advantaged accounts is one tool an advisor can employ that can add value each year. •	Employing cost-effective investments. This critical component of every advisor’s tool kit is based on simple math: Gross return less costs equals net return. •	Maintaining the proper allocation through rebalancing. Over time, as its investments produce various returns, a portfolio will likely drift from its target allocation. An advisor can add value by ensuring the portfolio’s risk/return characteristics stay consistent with a client’s preferences. •	Being committed to being students of the markets. Never being satisfied and always looking for new opportunities and most importantly never get tired of learning because we think we “know it all”. WT Wealth Managements approach utilizes all of these principles, making us feel like we have the potential to add additional net returns for our clients. Consistent out-performance should not be viewed as an annual event and something that can be always counted on and continually expected. Research emphasizes that it is more likely to be intermittent, as some of the most significant opportunities to add value occur during periods of market duress or euphoria that tempt clients to abandon their investment plans and act on powerful emotions like greed and fear. In such circumstances, we may have the opportunity to add tens of percentage points, rather than merely basis points. Although this wealth creation will not show up on any client statement, it is real and represents the difference in clients’ performance if they stay invested according to their plan as opposed to abandoning it.